We believe wearable technology can be the next big thing to undo the overseen or remain to be seen harms of mankind’s so far technological advancements. With such thought in mind, we designed a swimwear that is environmentally proactive, economically sustainable and intelligently manufactured combining cutting edge 3D printing and nano-scale clean-tech material research. 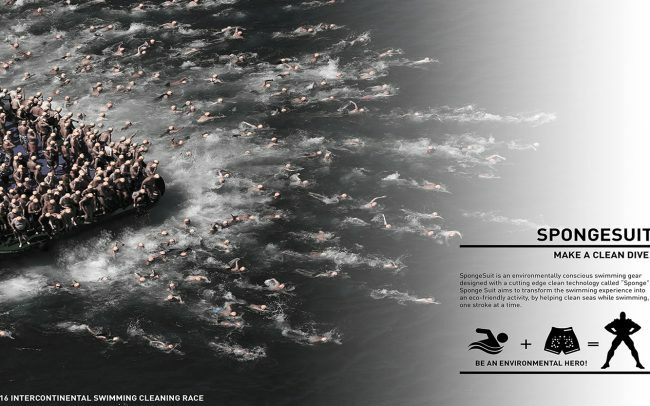 Sponge Suit aims to transform the swimming experience into an eco-friendly activity, by helping clean seas while swimming, one stroke at a time. Sponge Suit is designed in two main parts. The net-like white shell surface is made of 3D print elasto plastic. This special material has the necessary flexibility to fit the body and the sufficient strength to encapsulate the filler material. The filler material is a super-hydrophobic carbon based material called the Sponge. This material has multi-model porosity (micro/mezzo/macro porous) that allows it to be a light yet strong absorber with its undulating texture (visible through Electron Microscope). Absorbing everything but water, the material is a powerful tool for water and contaminant separation. The super-porous nature allows the Sponge to absorb in high capacity, up to 25 times of its own weight depending on the density of the substance absorbed. The Sponge does not release the absorbed materials unless it is heated in high temperatures (1,000 degrees Celsius) to re-obtain its original liquid form. This property allows the Sponge to be recyclable as the liquid form is ready to be reshaped having been separated from its contaminants. In the near future it is not hard to imagine facilities, much like dry cleaning locations, that collect these Sponge Suit to recycle the Sponge to separate any contaminants. The form of the Sponge Suit is inspired by the super-porous, mesh-like structure of the Sponge material. The final form of the 3D print shell was obtained through the various iterations of the same undulating form. The filler amount and the allocation were identified by creating several design alternatives, considering the form and the ergonomics of the human body, while pushing the limits in translucent swimwear design. The optimized current design weights only about 54 grams in a surface area of approximately 250 centimeter square and thickness of 2 millimeters. This shape and volume of the Sponge makes the wearable portion reusable for a long term. 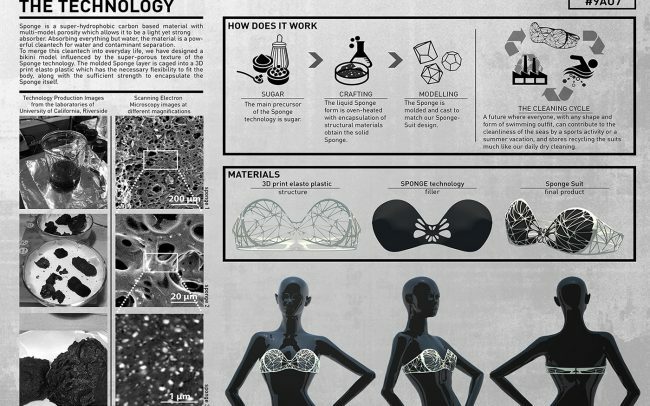 SpongeSuit design also promises mass-scale production with its affordable structure. The Sponge itself is highly cost-efficient with the main precursor being sugar. Per gram cost of Sponge is roughly 15 cents, a reducible cost when achieving economies of scale. 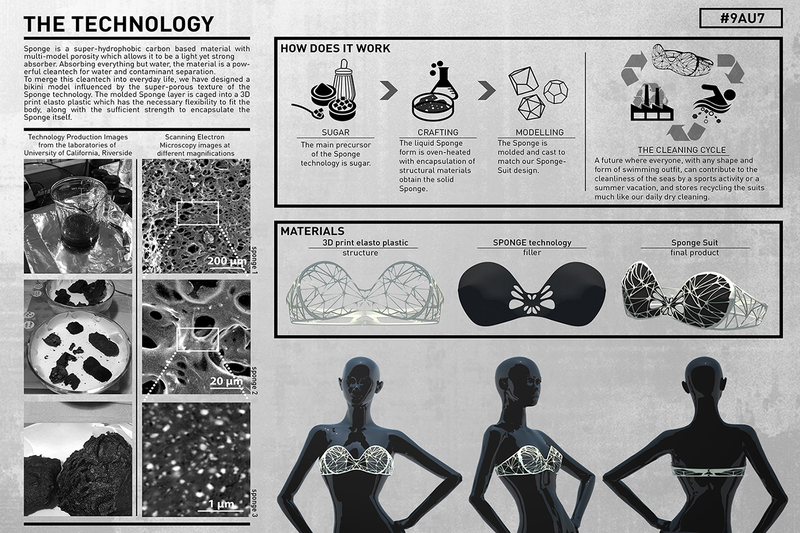 SpongeSuit is a preliminary effort to create an actively eco-conscious wearable technology. This design can be developed in to different outfits: bathing suits, mayokini, swimming caps. Reprogrammability, recyclability and affordability are intriguing properties of the technology, allowing room for further research and development in clean-tech wearable. 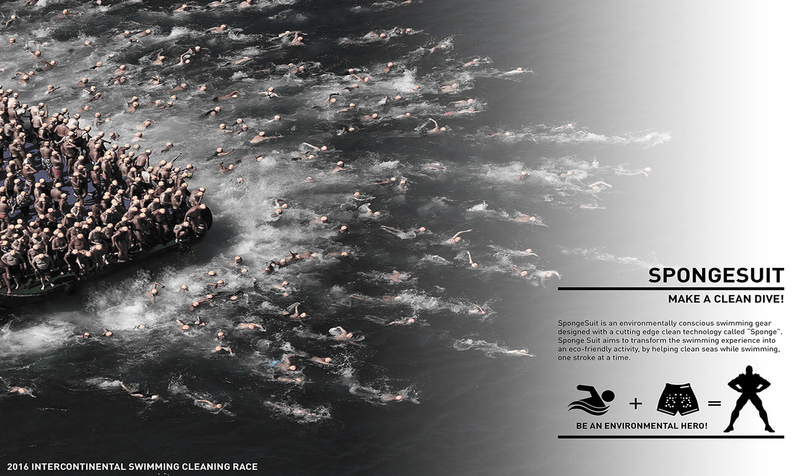 We aim for a future where everyone, with any shape and form of swimming outfit, can contribute to the cleanliness of the seas by a sports activity or simply a leisurely summer vacation.